Following on from last week’s family history piece, The Crystal Necklace, here’s another republished and slightly revised memoir piece, Artichoke Fields, coming from certain episodes in childhood, when I was around 12-13. 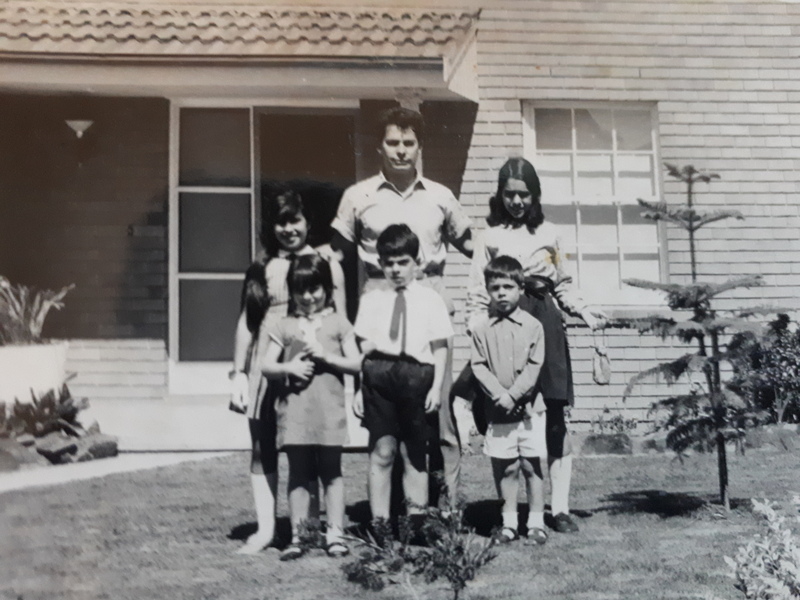 Around the time this piece is set: my father with me(at back, next to him) and four of my siblings, Camille, Gabrielle, Louis and Bertrand. Photo taken by my mother. It is a hot day in the seventies, and we kids are fighting quietly in the back of the car. Maman occasionally shoots glares at us in the rear-vision mirror, silently warning us to behave. Meanwhile Dad drives steadily, carefully, as if he is anticipating all kinds of possible dangers, as if years and years of driving have not cushioned him against the myriad possibilities of danger and catastrophe. When I am older, it comes to me that this is how he has lived his whole life, on the brink, never taking it for granted, trying to keep control of it yet jumpily aware of the knife-edge of life, of the unpredictable way in which, in a second, things can change forever. But at the time, his careful driving is merely another of the mix of traits, the shorthand of experience, which, together, make up “Dad”—this person who you accept naturally, as you accept your mother, or your brothers and sisters. As a child, you rely on signs, on the known, and somehow accommodate contradictions and complexities without really thinking about them. But here we are, driving. The vinyl of the seats sticks to our flesh, so the too-close warmth of a brotherly or sisterly leg in the backseat of the Holden leads to under-the-breath quarrels about the most ridiculous things possible. It’s summer, and we are driving from our northern suburb into the semi-rural west of Sydney, near Blacktown. As we approach, Dad sits up more in his seat. Even though–or maybe because–he is city born and bred, he loves the country with a fervour born of happy memories of his great-grandparents’ place in the Aveyron. When he was a small child, he would go there for holidays, and he has told us many stories of it, his eyes misting with a regret which I didn’t quite understand at the time. Later, I see it is not only nostalgia, but something more powerful–a need to hold on to a good, simple thing within a wartime childhood booby-trapped with painful memories. The good memories connected with this kind of place have transformed Dad, at the moment. He does not look anxious, or harried; his even, smoothly pale olive skin is unmarked by frowns. He says, “It’s astonishing, isn’t it, to see how hard these people work, ” and his tone is gentle, wondering, filled with the pleasure of contemplating the simplicity of work on the land. It is traditional for him to say this, here; yet always Maman nods, patiently, always we hear him without wondering at its repetition. We stop in front of the house. It is a very simple fibro construction and we have only been further than the kitchen once or twice. But the house is unimportant. What is important is beyond it, in the flat fertile acres that surround the house, making it an island out of time, its plain Australianess an incongruity in the lavish Europeaness of cultivated fields. For here are not acres of wheat, or of the other large, full-scale crops we associate with this vast land; but the smaller, denser patches of hand-grown vegetables, in different seasons: lettuce and spinach in serried rows, tomatoes and capsicums and eggplants ripening in sunrise colours, and especially, most especially, the artichoke fields. There the artichokes stand, tall and fierce in their greens and purples, acres of them, their tightly-packed heads swaying on their strong stems. Some of them are already going to flower; and their perfume–a strong, sweet smell, like wild honey–fills the air. They are extraordinary, beautiful and wild as a Van Gogh painting. The sight of them always catches at my throat, so that even now, years later, I can see them, smell them, and wonder at the selectiveness of memory that will keep such pictures and not others. And, like a Van Gogh painting, if you don’t simply stand on the sidelines, admiring, but venture inside them, the artichoke fields will reveal all kinds of unexpected things. Here, in that childhood time, the farmers come to greet us, their sun-brown, wrinkled faces split by their smiles into a hundred tiny rivulets. I never learnt their names, and to me, at that age, they look agelessly ancient, like peasants in an old picture. They are small, both of them, both dressed in black: but he is lean and wiry, with crew-cut greying brown hair and sharp pale eyes, while she is round as she is high, her breasts like soft pillows under her shabby dress, her silver-and-black hair done up in a floppy bun, her eyes like lively brown birds in their nest of wrinkles. She is Maltese, he is Yugoslav. 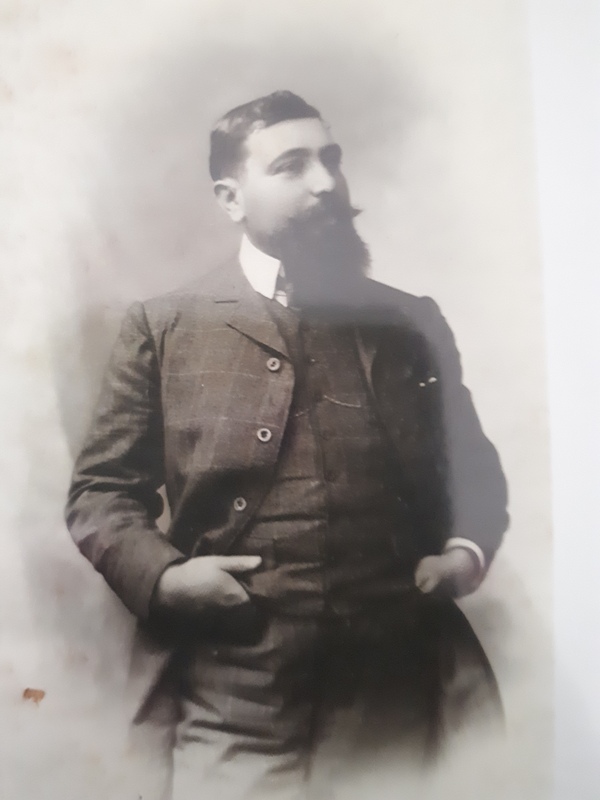 Dad, accustomed, at the building sites he supervises, to working with Balkan men insisting on their Croatianess, or Serbianess, or Bosnianness, wonders at the farmer’s calm avowal of being ‘Yugoslav’–what does this show about his politics?–but does not press the point. But on the way home, he will say, “Hmm, say what you like, I’ve always found Yugoslavs difficult people to fathom. It’s really the extremity of Europe, you know. .” And I wonder at the need of adults, too, for shorthand, for second hand wisdoms. But he finds the female farmer, the Maltese, very sympathetic. “Eh, paysan!” she says (‘Hey, countryman!’), or that’s what it sounds like to my delighted father. Her voice, high, distinctive and confident, is ageless, too; we have heard, on a record at home, Portuguese peasant girls singing in exactly the same kind of shrill yet in-key voices. Dad is immensely proud of it, preening under the accolade which she shrewdly–but not insincerely–gives him. Maman is rather more circumspect; not only is she a more detached observer of people, but she is also closer–only one generation removed–from peasant origins, and she has few illusions about it. “She’s a good saleswoman, ” is all she will say, later, when Dad, talking nineteen to the dozen about these wonderful salt-of-the-earth people, drives us back to our somnolent, rich suburb where the quiet he both craves and resists attacks his restless spirit like a physical pain. Dad addresses the farmers in a mixture of languages: a bit of English, mixed with a little French, fragments of Italian he’s learned on building sites, and even a bit of patois, the Occitan-derived dialect of the Toulouse area, where he comes from. The farmers answer back in a linguistic mosaic too, and Dad is always particularly thrilled if they appear to understand some of the patois; he sees a connection between all kinds of European languages and to hear this confirmed, especially here, the homely patois under the alien sky, is a source of joy. We walk with the farmers down the paths that lead away from the incongruous Australian house (where their only child, a daughter, sits eating biscuits in front of the television) and into the European preserves of the farm. Here, before you reach the hand-cultivated fields of vegetables, are neatly-arranged poultry runs, with chickens running about, and rows of hutches, where blink fat rabbits. There are no pets or superfluous things; in this setting, away from the house which diminishes them, the farmers are tough, witty, their tenacity written in their faces, with none of the irritated bewilderment which must surely seize them sometimes. I think of their daughter and how it must be for them all when they have to come up to the school. I think of it because it’s how I feel. When my parents come to my school, I am in shameful agony, hoping they won’t say the ‘wrong’ thing in the ‘wrong’ sort of accent. There are other people we know, Sicilians from rural backgrounds, whose attitude towards their educated children is humble, frighteningly so in fact. My parents aren’t like that, at all, they are better educated than I am and would soon cut me down if I tried to patronise them; yet still I cannot help fearing that they’ll say the wrong thing. So I wonder how these two, these farmers, and their daughter, must feel like, when they have to leave the artichoke fields and go to the school, or the supermarket, or the myriad things one must do in this society. It makes me squirm, this thought, and so I turn away from it, and towards the fields. It never occurs to me back then, of course, that maybe it did not touch them, that the shame may only be in the minds of self-conscious children. At first, we look in the hutches, say, “Isn’t that one sweet?” and the farmer grins at us, showing crooked teeth, and says, in her strongly-accented English, “Good eating, that one!” We are at the age, in the place and time where such statements appear callous; so we are silent, and ignore Dad’s I-told-you-so-smirk. He has often said we are becoming too soft, sentimental, Australian; Europeans are tough people who look reality in the face. You like lapin a la moutarde? Right, well then you must be ready to first catch your rabbit and kill it. Or to plunge your hands without disgust into the freshly-killed carcase of a chicken and make it into a dish. We are tenderhearted; but our feelings never extend to the nicely trussed, carefully jointed roast that appears on the table. . .
Now the farmer is walking in the artichoke fields, talking shrilly, a mixture of salty comment on current events, and wild praise of her vegetables. Her husband is silent (“Taciturn, like all Yugoslavs, ” Dad is delighted to say) . But he smiles quite a bit, and touches the plants, gently, as if he is greeting each. That, surely, is only my fancy. He and his wife are unsentimental, without frills or falsity, honest, as the French saying has it, as ‘du bon pain’, good bread. But that, surely, is a sentimentality, too; for I have heard Maman saying that these two never lose ‘le nord’, always stick to what they know they want, and are not above using cajoling or even a judiciously-placed marketing ploy to sell their vegetables. They are not doing this for fun, for ‘du folklore’: that is the mistake of urban people, throughout the ages. Simplicity is in the eye of the beholder. Every so often, the farmer stops. She throws an arm out to her husband: yes, this one. He stoops, cuts the stem, throws the vegetable into the basket he is carrying. Dad keeps pace, asking the woman all kinds of questions. She answers with aplomb and humour, in her shrill voice, while her husband fills the basket and smiles what my mother would call a ‘corner’ smile; amused but enigmatic. We children follow behind with Maman, the smell of the big vegetables filling our nostrils with a heady odour. We all love artichokes; some Sunday nights, that’s all we’ve eaten, an enormous tureen filled to the top with the boiled vegetables, served with vinaigrette on each person’s plate. The table would fill up with mountains of discarded leaves, plundered for their bit of sweet flesh, then put aside for the next one. There is something addictively wonderful about artichokes; the more and more frenetic peeling-back of leaves, till you get to the ‘straw’ inside, and peel that off as cleanly as a bandage, to reveal the succulent flesh of the heart. 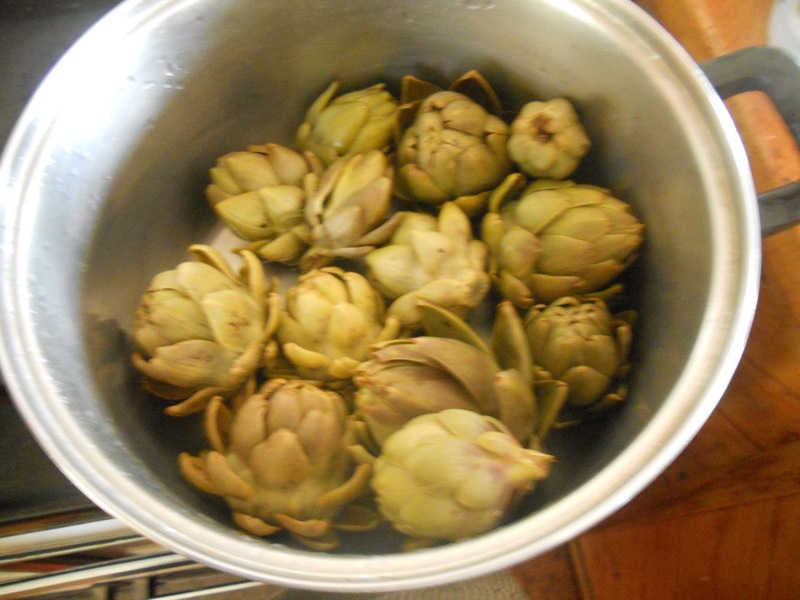 We ate the stems, too; the Blacktown farmers always sold us young, fresh artichokes, so that their stems were as tender as asparagus. Occasionally, we’d eat them with butter and garlic, or tomatoes. But the simple one, the boiled-and-vinaigrette ones was what we preferred. We always lingered in those fields, dodging prickles, and in areas where the purple flowers were really out, the bees as well, maddened, as we were, by the heavy smell of the artichokes. Once, I remember, the farmer picked one of the flowers and gave it to me. The unexpectedness of the gesture surprised me, and for the rest of our time there, I couldn’t resist putting my nose as close as possible to the flower. I’ve always been sensitive to smells, finding them powerful evokers of emotion and place, and now, I try to think what it was that made this smell so heady. Roses smelt sweeter, muskier; vanilla smelt more homely and tender; the rich dark smell of roasting meat made me feel hungrier. This was a smell of almost-wildness, of something only just tamed, and only dimly understood, something whose discovery was concealed under layers of half-meanings. It was not the smell of careful, cultivated Europe, neatly arranged, tamed and civilised, the Europe of the mythologisers or the nostalgic. Rather, it was the smell of the Europe whose inheritance was mine, which seeped into me like instinct. A Europe–a France– not only of the mind or of the comfortable senses; but also one of the blood’s leap, of the pain of rejection. The France my father felt in exile from, the France my mother followed him from, despite her own rather less ambivalent feelings. A corner of Europe forever elusive, never quite pinned down, half-wild, half-tame, of heady, unforgotten smell, uncomfortable at times, maybe never to be fully understood. A few years ago, I wrote this piece about my paternal great-grandmother, Irma Mazars, starting with a meditation about the lovely rock crystal necklace, which along with a beautiful ebony cicada brooch, is something I inherited from her. I thought it might be interesting to revisit it here, slightly revised. And this time, with photographs.. The rock crystal necklace best shows its sheen and beauty on the skin, glittering in the hollows of the neck like raindrops lace the grass. A hundred years ago when it was new, there were little shards of bright bronze set in between the crystal stones, but these have long since dropped off, leaving patches of moss-green verdigris so subtly worked in that they look as if they were always meant to be there. When I take the necklace off at night, the skin-warmed stones run through my fingers, cooling as they splash into my palm: the lucent streamings of memory. 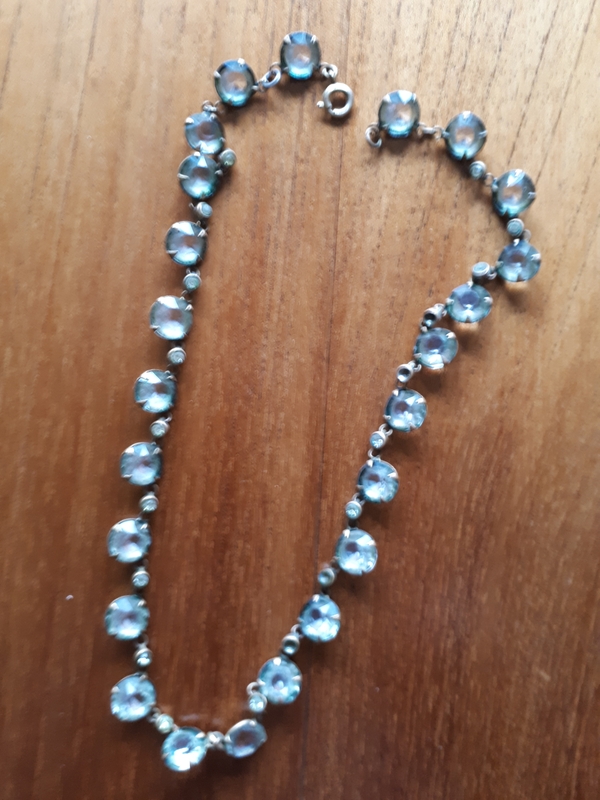 Once, the necklace had lain against the violet-scented, rice-paper neck of my great-grandmother, Irma Mazars, and I loved it much more than the diamonds she wore on her fingers. She had been given the necklace by my great-grandfather Louis Bos, long ago when she was young and he was her older, married lover. There was something rarer, more precious about the string of crystal than the harshly-sparkling rings: I called it “le collier de pluie”, to myself– “the necklace of rain.” Unlike the banal diamonds, which had no imprint of time, it seemed to speak of its vanished age, the shining age spoken of so longingly by my haunted father; Irma’s world, the world known as la Belle Époque. La Belle Époque: the words themselves, in their nostalgic closure, made of that period an era beyond history, somehow: the last beautiful, stifling gasp of the nineteenth century before the dark twentieth had yet made its presence really felt. A luminous bubble, we imagined it as; a time when we could dream that neither national nor personal hatreds marred the steady harmony of people’s lives. There was never any fighting at Irma’s place, nor any reheating of the high-smelling old quarrels which for several generations had made of my father’s paternal family history a space of both tragedy and comedy. Irma’s family, her space, seemed to me different: neither comedy nor tragedy, but something solid, well-planted, yet not smug or even respectable. 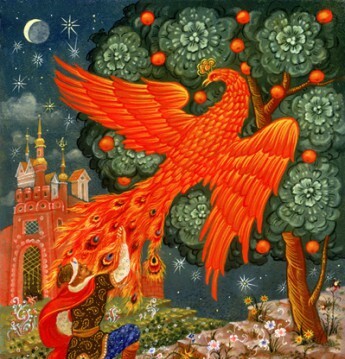 There was peace and a kind of predictability, but of the kind that exists in enchanted places. It did not matter if we arrived early or late at her apartment; always, waiting for us on her nests of little tables would be pastel paper-lace boxes of sugared violets, candied roses, tiny icing-gilt cakes and syrupy sweet marrons glacés, crystallised chestnuts; and tin cups for us children, standing by slender-throated bottles filled with grass-green Sirop de Menthe and scarlet Grenadine cordials. For my parents and Irma herself, there would be the indulgences of eternal tipsy summer: either a potently home-made cherry Ratafia, a peach Rinquinquin or her favourite, Confiture de Vieux Garçon, Old Boy’s(or Bachelor’s) Jam: a layered confection so sugar-heavy with summer fruit and fiery brandy that the adults moved like stunned bumblebees after just a whiff of it. But always, something lovely for us: she was wonderful with children–kind but never patronising, full of indulgence but tough when she needed to be. 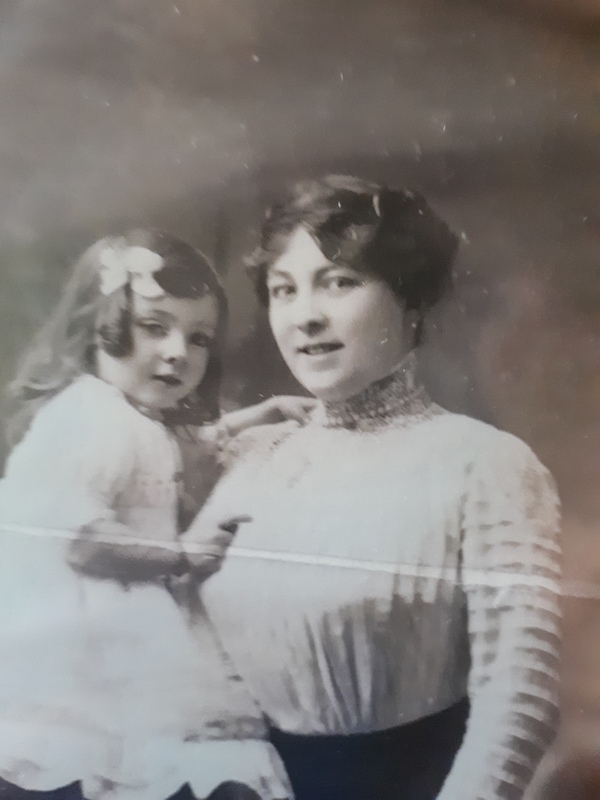 She adored my father, her favourite grandchild, who had lived with her for a couple of years during the war; but she also loved his sisters, and she loved having us visit her. (And as I lived in early childhood with my grandmother, her daughter Zou, she had been quite a presence in my early life too) . There were more nymphs in the attic, packed away in boxes. Ah, the attic! Home not only of nymphs but troves of vanished splendour: camphor-and-lavender-scented chests full of hobble-skirted muslin dresses and rustling evening gowns, pale pink high-heeled kid shoes, silk stockings and cartwheel hats in round boxes, and we stared and laughed with excited joy as we rummaged through them and tried them all on. They might just as well have been relics from the age of Louis XIV, for all their exotic, strange magnificence; we simply could put no imaginative boundaries to a period when such fancydress was commonplace. In the chests were also menus and dance lists and old letters, done up in bundles with fine lacy ribbons tying them; the others ignored them, finding them dusty and dull, beside the rutilant rivers of rags, but I pored over them, imagining I would find an old ticket for the Titanic’s maiden voyage, or a secret letter from a lovesick prince. Once, we found Louis’ elegant sepia recipes for prize-winning cordials and tonics and punches: his family had made their solid fortune from the making and selling of drinks of all kinds, and in one corner, shrouded in dust, was a collection of engraved soft-drink bottles from the Bos factory. In another chest was a collection of old L’Illustration magazines: the first ones from 1900, the last just before the First World War. I savoured them all: the fashion parades, the travel notes from far flung colonies, the reports of train crashes and automobile shows and aeroplane trials, the excited reports on cinema and phonographs and electric light and forensic detection. L’Illustration was sure that progress was inevitable; it also showed me why Irma loved technology and gadgets, devoured articles on the space race and watched television devotedly. parents, Aveyron dairy farmers, never took to photography, although she was their cherished only child. They had ambitions for her that went well beyond the farm; they ‘bled their four veins’ as the French saying has it, to buy her off-the-peg versions of Illustration models and braved chilly teachers to get her elocution classes. But she still grew up knowing how to milk cows and stuff geese and sell and buy land as well as powdering her face and decorating pretty hats and showing a trim ankle and speaking in a flutingly vulnerable voice. Much later, she was to slightly shock us children by her sharp irony and her readiness to return to peasant skills: I can see her with her soft white arms deep inside the cavity of a chicken, fingers deftly working away, releasing fugitive rumours of violet and lavender fragrance as she moved to and fro between the table and the sink, her rings and jingling bracelets in a glittering pile on the dresser. She never lost ‘le nord’, did Irma; she had no sentimentality and few illusions. 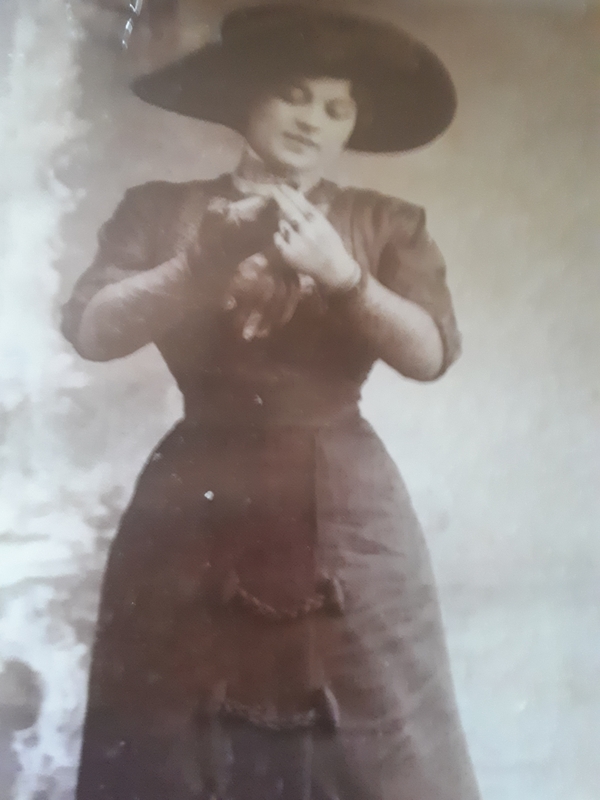 Irma was an eighteen year old apprentice milliner when she met Louis. He was nearly thirty years older than her, very much married, very much a paterfamilias. His social standing was very high, much higher than hers: not only was he a prominent member of a long-established wealthy business family in Decazeville but its Mayor for a while, then regional councillor and aspiring national politician (though he never made it to the national stage in the end, most likely because of his scandalous love life). On Irma’s wall hung some old tinted photographs of Louis, in large, ornate Second Empire frames, like paintings: as a child, in a velvet suit, by his rocking-horse, his stare imperiously blue, his hair brushed painfully down; and Monsieur Bos, very much the respectable nineteenth century businessman in neat beard and smart suit, but still with that imperious blue gaze. Fashionably freethinking, a member of the Radical Party (which despite its fire-breathing name was more what people might call centre left, these days), he was also agnostic and a Freemason—at least until his deathbed. As well, though, Louis indulged the sentimental Catholicism and highly burnished respectability within his family. For him, Irma must have been both a breath of heady new century’s air–and the continuation of a well-upholstered tradition. 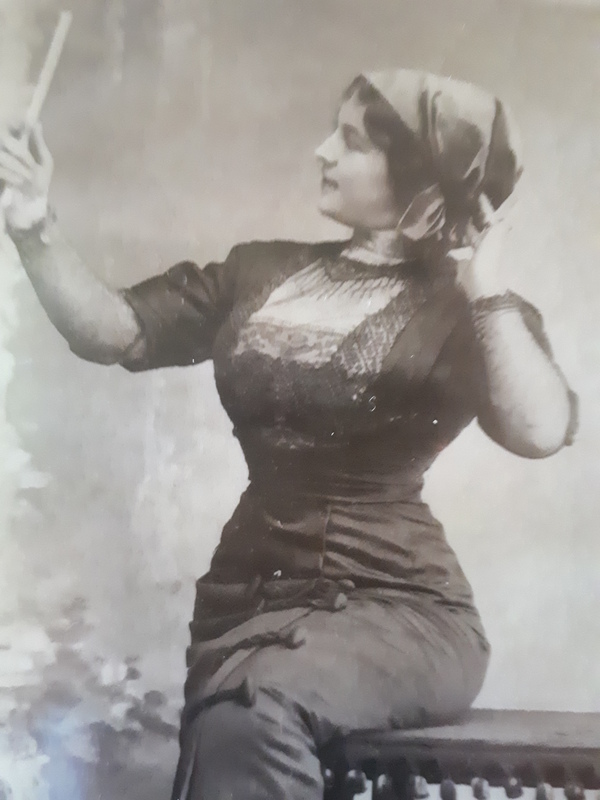 He had soon safely installed her as his mistress in a smart new apartment in faraway Toulouse and bought her the lease on a millinery shop so that she could hold her head high and have no-one gossip about her as a ‘kept’ woman. Irma’s and Louis’ only child, my grandmother Marie-Louise, familiarly known as Zou (and Mamizou to us children, later), grew up as the enchantingly pretty blond only child of a union that despite time and Louis’ incorrigibly-roving eye, never faded away. Louis visited his second family frequently, and idolised his pretty daughter. Every time he came, he brought the child and her mother boxes of pretty dresses and jewellery and flowers and comfits, and paid for many expensive studio photographs of Zou at every conceivable age, sometimes alone, sometimes with her mother, exquisite yet robust decorations that he kept with him. He was rewarded with Zou’s letters, written in unsteady curly writing on scented pale paper, which always began: Mon cher petit Papa. . . But all that time, Irma and Louis stayed unmarried to each other; Monsieur Bos had a respectable family and business life to maintain. In fact, some years after Zou’s birth, Louis’ seventh legitimate child was born! It was not until after Zou’s marriage to the glamorous and wealthy Robert-Rene Masson, my grandfather, that Louis’ long-suffering wife finally tired of his doings, threw him out and divorced him, and he was finally forced into dissolving his double life. So finally he became Irma’s lawfully wedded husband. 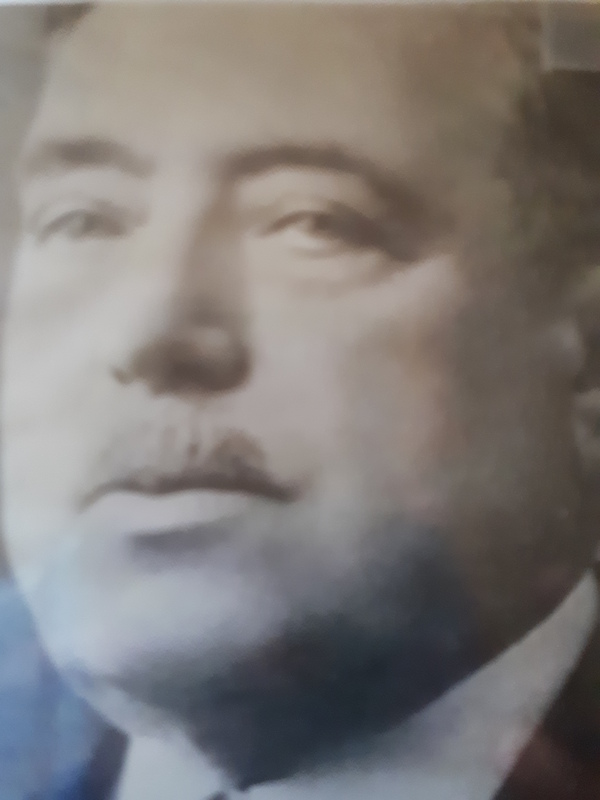 Louis died long before his daughter’s brilliant marriage shattered into a thousand wounding pieces after the traumas of World War Two. The last years of his life were spent held in the sweet protection of Irma. He no longer had any money of his own. So he was dependent on the tidy income Irma had made first from the millinery shop, then, when that was sold, from the cunning real estate investments she made. Louis was proud of Irma, as he was proud of Zou; perhaps he recognised in both of them the sound business sense he lacked himself. But he also considered himself tamed, not broken; and Irma’s final years with him were full of the comfortable irritation of his attempts at further gallant adventures. But he was also a devoted father and grandfather; my father speaks of him very fondly. Irma’s parents had been heartbroken at first by their daughter’s state of sin. This was not what they had intended for their golden girl. But they were peasants, not vaporously respectable bourgeois; continuity, whether legitimate or not, was the important thing. So they welcomed first Zou, then Zou’s children. My father, escaping from the painful ambiguities of his parents’ later history, for ever after saw the holidays he had spent on the little Aveyron farm as not only his personal golden age, but a glimpse into a vanished national golden age. They were representatives of the true France, for him, eternally patient, enduring France. But Irma herself never spoke of them; she did not contradict her beloved grandson Georges when he waxed lyrical about the feeling of fresh pump water on his head in the morning, and the warm smell of milking cows, but tilted her head just like in the photos, that look I had thought of as showing the peasant toughness under the sculpted polish. Now, I wonder if it was not that; but a kind of crystalline tenderness that lived à fleur de peau in my great-grandmother: just under the hollows where her raindrop necklace lay. Postscript: Some years ago, after I wrote this piece, my father was contacted by an unexpected family member, whom he had never met before: a cousin on the Bos side who was the grand-daughter of Louis and his first wife! Curious about her grandfather’s double life, Françoise had done some research and found my father–and so he, and we, began to know something about Louis’ ‘other’ family. As did she, in her turn. Old wounds had healed, and now it was time for the two sides of the family to get to know each other.